Tuesday – Another day in paradise – Helen Walter, Ph.D.
Dana and I starred with our morning roll out of bed and meet the students for 7am breakfast. As always, Loren, our faithful waiter helped us with food choices and the many cups of coffee we were beginning to enjoy. After breakfast we headed to our boat to meet Captain Dean, Edwin and Alson for our two dives. Our first dive was to Barry’s reef and our second was to Green Outhouse Wall. 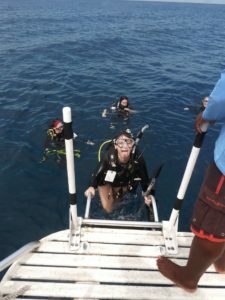 Some students spotted a Lionfish, an invasive species that gladly we’ve not seen a lot of, and a nurse shark hiding under a ledge. 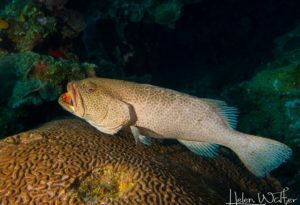 We saw a Tigegr grouper getting cleaned by some Neon blue gobies. Looks like someone enjoyed the dive! Lunch was followed by two amazing lectures on coral reef threats and their future. Jennifer presented work that’s been collected st RIMS for the past 20 years. They have tracked a number of quadrants in several dive sites over these years to collect the data, which has shown a 46% loss in coral. Students also learnt about the devastating effects of Hurricane Mitch and on El Niño on the reef. Then we had a little free time, which was good because many of us were sleepy. Dinner was followed by our community time. Dana, Chicora and I went over safety thoughts, again trying to make our students better scuba divers. We talked to them about staying healthy, in communicating with us if something felt wrong, or they weren’t feeling well, so that we could help them. We are all very glad for Chicora and their medicine bag as some students needed anti-histamines, some needed itch relief from the mosquitoes and sand flies, etc. We also spent so,e time talking about weight send buoyancy, encouraging some of our students to drop weight. Being overweighted is something new divers do a lot. It helps to be correctly weighted so your air consumption improves, but also so you don’t flail around as much, which can potentially damage coral and other marine life structures. This was followed by a number of presentations that the students are doing in different marine species. This evening we learnt from Julia that Brittle stars can lose a limb and regrow it later when threatened by predators. Lizbeth introduced us to the Pantropical Spotted Dolphin and we found they care for their young for a long time! Sea cucumbers and their “interesting” physiology was the subject of Molly’s presentation. Molly had picked this topic as when doing some refresher dives in Monterey she’d come across a lot of sea cucumbers. 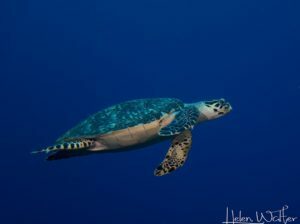 However, she hadn’t seen many in Roatan so we made a pledge to find her some. Hayley got us excited about Caribbean Reef Sharks that we would be going on a dive with in a few days. Marisol ruined “Finding Nemo’ for us by explaining Spotted Eagle Rays probably do not migrate. Sigh. Oh well. We still love that movie. We left our students to write community reflections and their field journals and headed to bed for another early start tomorrow. Previous: Previous post: Monday – Our first day! Next: Next post: Wednesday – More than Four Sponges!